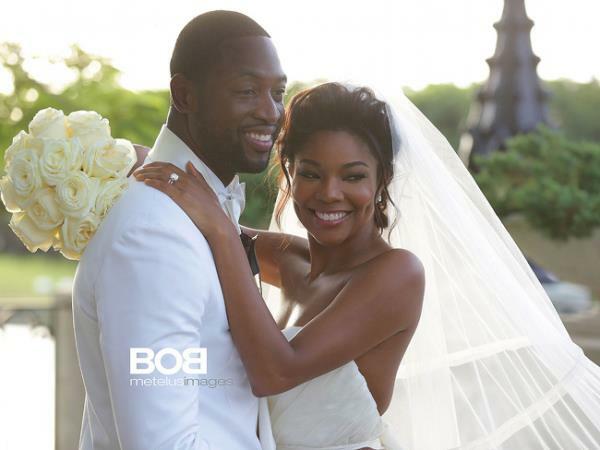 Actress Gabrielle Union has finally tied the knot with her basketball star partner Dwayne Wade. The superstar couple got hitched in a beautiful ceremony at the Chateau Artisan Miami, which is a castle that sits on 14 acres amid a private lake and royal gardens, reports necolebitchie.com. According to the gossip site, there were about 200 wedding guests, which included Kevin Hart and his fiancée Eniko Parrish, Ludacris and his girlfriend Eudoxie, Terrence J, BET’s Stephen Hill, Quentin Richardson, Dorell Wright, Carmelo and La La Anthony, LeBron James, producer Will Packer, actress AJ Johnson, Donte Stallworth and ring designer Jason of Beverly Hills. E! News obtained sketches of Gabby’s wedding dress, which was designed by Dennis Basso for Kleinfeld. All females in attendance were asked to match the bride in white, and the men dressed in all black to match the groom. It is also rumored that John Legend serenaded the couple at the wedding.